The Credit Hours Confusion is not only interesting but also reflective of the lackadaisical attitude of the powers that supposedly control medical profession in India. There are several confusions and discrepancies with regard to the required credit hours, award of credit hours, exemptions etc., between various state medical councils. These confusions began right at the start. The Amal Dutta Committee had recommended a minimum of 30 CME credit hours per five years; but, the national workshop conducted by the MCI in May 1996 and the General Body meeting of the MCI held in Feb 1997 recommended 30 credit hours per year, i.e., 150 credit hours per 5 years. Five years later, the Indian Medical Council (Professional Conduct, Etiquette and Ethics) Regulations, 2002, recommended a professional to attend 30 hours of CME every 5 years, but the meeting of the executive committee of MCI held in Sep 2002 stipulated 30 credit hours for 5 years, and then allocated 2 credit hours per 5-6 hours of CME Programme. The regulations of 2002 require only 30 hours of CME per 5 years, but the Scheme of MCI, supposedly to implement the very same Regulations, requires a doctor to attend 90 hours of CME to obtain 30 credit hours (@ 2 Credit hours/6 hours of CME)! But there is more! According to the MCI Scheme of 2002, each CME programme of two days (5-6 hours daily) shall be eligible for a maximum of four(4) credit hours and if it is only for one day of 5-6 hours, the credit hours shall be two(2). But according to the letter MCI – Academics/2013/30661 dated 29/08/2013, the academic council of MCI recommends 2 credit hours/day/participant for any Conference/CME/Workshop of minimum 8 hours duration/day, for a medical college teacher. Instead of 2 Credit hours/6 hours of CME, the same MCI recommends 2 Credit hours/8 hours of CME, specifically for medical college teachers! Accordingly, a medical college teacher must attend 120 hours of CME per 5 years (@ 2 Credit hours/8 hours of CME, to obtain 30 credit hours), when the Regulations 2002 stipulate only 30 hours! There is much more: as all the state councils offer 4 credit hours/year automatically to medical college teachers (see Table below), they would be required to attend not 120 hours, but just 40 hours in 5 years to get the remaining 10 credit hours (or better, just give 2 lectures per year in any of the CME Programmes!). The Karnataka Medical Registration Act amended in 2003 requires a Medical Practitioner to produce certificates for having attended CME Progammes for not less that one hundred hours; it does not mention of credit hours and it does not specify the number of years. But the KMC, acting on the basis of its own resolutions (as per the above mentioned RTI response) stipulates 30 credit hours per five years, that translates into 120 hours of CME (@ 2 Credit hours/8 hours of CME). Mind boggling, to say the least. The Travancore-Cochin Council of Modern Medicine had tagged renewal of registration every five years, to 30 hours of CME programme in May, 2004. The notice issued by TCMC again on Jan 9, 2015, stated that a physician must participate in professional meetings as part of CME Programmes for at least 30 hours every year! While some state medical councils have made renewals mandatory with requisite CME credits, some others are seeking renewals without mandatory credit hours and some have started awarding CME credits without any need for renewal. But the reasons for such discrepancies between the states are not clear at all. The required credit hours are also not uniform across the states. While Karnataka has stipulated maximum 6 credit hours per year (30 for 5 years), Punjab requires 50 credit hours for five years. Although the Gujarat Medical Council Act, 1967 has not made CME Credits mandatory for renewals, the revised CME Guidelines stipulate 30 CME Credit hours per year, i.e., 150 hours for 5 years! In Gujarat, medical practitioners aged above 60 years are exempted from mandatory CME, in Karnataka the age limit for exemption is 65 years and in Maharashtra it is 70 years, but in Uttar Pradesh (UP) and Madhya Pradesh (MP), no one is exempted! And worse, the credits awarded for CME and other activities are highly variable across the states. These guidelines are unduly favourable to the teachers in medical colleges. Almost all the states that have initiated the CME accreditation programme are awarding 4-6 credit hours to teachers of medical colleges and some states are awarding the same to Director and Joint director of medical education, Director and Joint director of health services and Deans of medical colleges. Does this mean that the teachers are automatically updated every year? Do full time, part time, fraction time and on-paper teachers qualify equally for these credit hours? Are the medical practitioners who are not attached to any medical college, but maintaining highest levels of medical knowledge, considered as ignorant and unworthy? Are the practitioners who regularly update themselves by online resources, text books and journals considered as fools? Do the medical councils that regulate evidence based medical practice have any evidence to prove that teachers in medical colleges are more up-to-date than medical practitioners who are not attached to a medical college? Do they also have any basis for awarding the different credit hours for various activities? the financial burden of the organizers, which in turn would have to be borne by the medical practitioners. 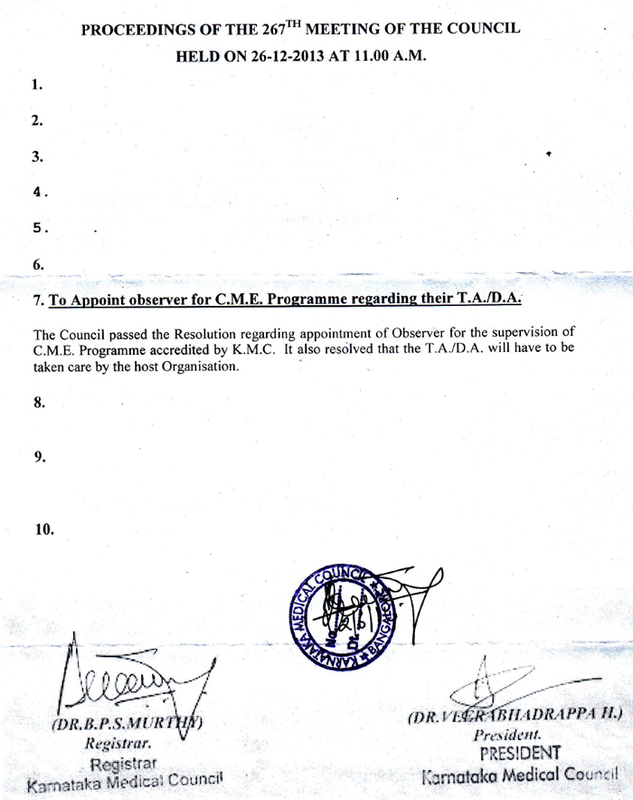 After two reminders on our RTI query, to provide the copy of the resolution, KMC sent a certified copy of the proceedings of the 273rd meeting of the council held on 26th December 2013, wherein it claims to have resolved that the TA/DA would have to be taken care of by the host organization. [See] It follows that any TA/DA paid to any inspector of KMC by any branch of IMA/API etc., or other organizers of CME Programmes/conferences held before 26th Dec 2013 must be immediately reimbursed by the Karnataka Medical Council. All those who have made such payments must claim the reimbursement from KMC.